Peter Heyden had a conventional Christian upbringing, but after the trials of adult life had begun to test his faith in the Church he began to wonder about the basis of modern Western religious belief and worship in its various forms. He set out to find the answers to some challenging questions about the foundations of Christianity and the origins of the Bible. 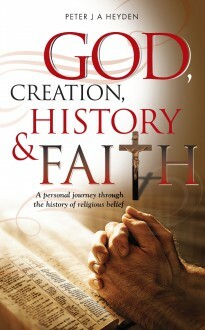 If you have ever wondered why we worship God the way we do and where our beliefs about Jesus and his Disciples, the Holy Trinity, the Resurrection and many other aspects of faith come from, God, Creation, History and Faith will prove fascinating reading. The author’s findings will engage both the committed Christian – of whatever denomination – and the sceptic.